Whether her ideas are correct or not. I truly believe that becaause of her inexperience in goverment. she should at least give herself some time to learn the workings of goverment. Unfortunately her own inexperience is what is causing her and the Democratic Party a few hicups that now they have to fight or disclaim or whatever they need to do. This country doesn't need any more extremists, none from the right none from the left. We need experienced goverment people that understand that the majority of Americans want a middle of the ground approach to the issues that we are presently facing. If either of those extremees continue with thier rethoric, the only thing that they will accomplis is confusing the voters. in the 2020 elections. You could say American workers are doing "better" Except for the FACT real wages have barely budged since 1964. American workers gained 11.74% in the 54 years since we had an honest tax system that encouraged the ones dividing profits to share with those creating the profits. 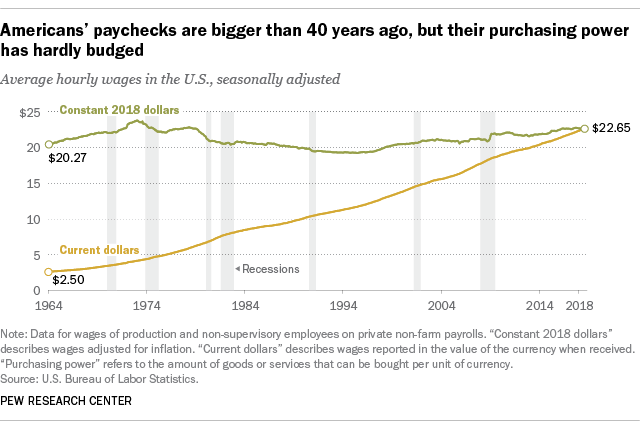 Sad fact is, the average worker has just gotten back to the pay s/he was gettin in 1970. We need leaders who are committed to creating a LIVING wage, not a minimum one, for American workers, along with a tax structure that actually supports and improves our infrastructure and social safety net without impoverishing our grandkids. AOC looks like a very good bet for just such a leader. No wonder the GOPerLords have pulled out all the stops to slander her with lies. Rasmussens has proven to be the LEAST accurate polling service, with a heavy slant to the right. 40.4% Approval with 55.1% DISAPPROVING. The Senators who will be voting to remove lil donny shortly after the Mueller Report is released will be looking at the more accurate polls. Sadly, anyone over the age of fifty-five will not live long enough to know the results of the witch hunt by the copious tax spending, incapable, poor excuse, for an investigator, Mueller, aka -Jacques Clouseau. What ever happened to his “slam dunk”? The Republican Conspiracy Theory sold under the rubric "flawed science" is based on the fact actual scientists in NASA and NOAA revised their computer models based on better data several years ago, Breightbart claimed this proved the models were no good and the Republican Propaganda Machine repeated the misapprehension every chance it got. Look at it this way - if it IS a "Conspiracy" to validate Al Gore, then how is it the entire World is in on it, and the ONLY place you hear anyone disputing the reality of anthropogenic climate change is in the Republican Propaganda Ministry and from shills for Big Carbon? To bad the Green New Deal is based on flawed science. Real data gathered by satellite and weather balloon tell a different tale than the computer based models of study that this Green New Deal is based on. As for Ms. Cortez, she is good at suckering in the dumb Dems, that's for sure! Oddly enough, I could find no reference to the "flawed science" you mention anywhere in the media or in any scientific studies. Are we pushing more fake news or is there a new study I missed? Perhaps something in Batman comics?